Microsoft Surface laptops are now eligible for “recommended” status in Consumer Reports’ ratings. Last year we removed that designation because of poor predicted reliability in comparison with laptops from other brands. Reliability evaluations are based on surveys of our members. We now have results from our latest survey. “Microsoft’s reliability is now on par with most other laptop brands,” allowing its products to be recommended, says Martin Lachter, a senior research associate at Consumer Reports. This is the first year that brand reliability is being factored into the Overall Scores for many products rated by Consumer Reports. Owner satisfaction, which is based on the same survey of our members, is also being incorporated into the Overall Score. The new reliability scores are ready just as we’ve completed our lab testing of the recently released Microsoft Surface Go. That 10-inch Surface Go, released in August, is meant to be a two-in-one laptop, though a keyboard must be purchased separately. The Surface Go isn’t receiving a CR recommendation, but that’s based on the results of lab testing, not member survey data. The Surface Go is the only Surface that isn’t getting a recommendation; the company’s other models, including the Surface Pro, Surface Laptop, and Surface Book 2, do score well enough to be recommended. 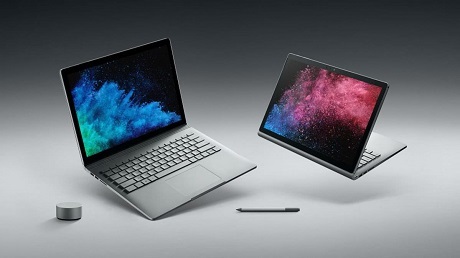 (Based on feedback from Microsoft, we are testing and rating these devices as laptops; last year we considered some Surface products separately as laptops and as tablets.) Learn more by visiting OUR FORUM.